Faced with an anxious dairy industry poised to complicate the next federal election for the Liberals — particularly in rural ridings in Quebec and Ontario — the federal Liberals are reviving the previous Conservative government’s compensation plan to ease the pain of recent trade agreements. 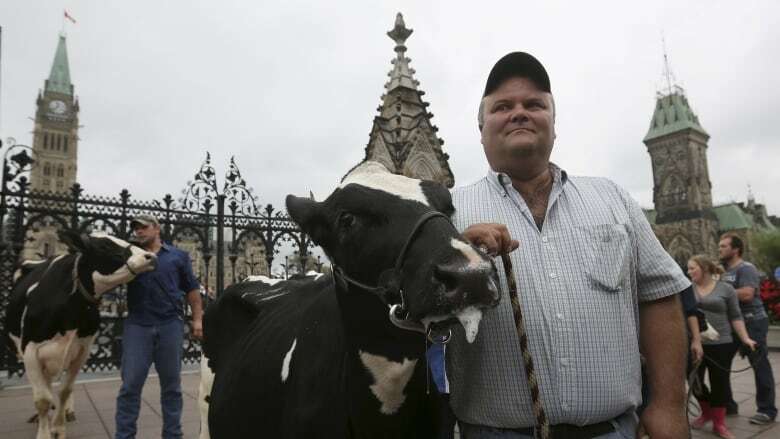 Dairy farmers brought their cows to Parliament Hill to put pressure on Stephen Harper’s government during the 2015 election, as negotiations for the Trans-Pacific Partnership (TPP) concluded. Tuesday’s federal budget may be trying to avoid similar protests against Justin Trudeau’s government this fall. (Chris Wattie/Reuters)Faced with an anxious dairy industry poised to complicate the next federal election for the Liberals — particularly in rural ridings in Quebec and Ontario — the federal Liberals are reviving the previous Conservative government’s compensation plan to ease the pain of recent trade agreements. Between trade agreements already in effect — with the European Union and Pacific Rim trading partners — and the still-unratified rewrite of the North American free trade agreement, dairy farmers have said they believe at least ten per cent of Canada’s dairy market has been given up to foreign suppliers going forward. Poultry and egg farmers are also at risk of losing significant shares of their supply-managed markets to American producers if the new NAFTA proceeds. Now, Finance Minister Bill Morneau’s 2019 budget is pledging up to $3.9 billion for an income-protection program for those sectors, along with a measure to protect the value of farmers’ quota investments. “There’s recognition that harm has been done. And that those revenue losses will be ongoing in the dairy industry,” said David Wiens, who represents Manitoba on the board of the Dairy Farmers of Canada. 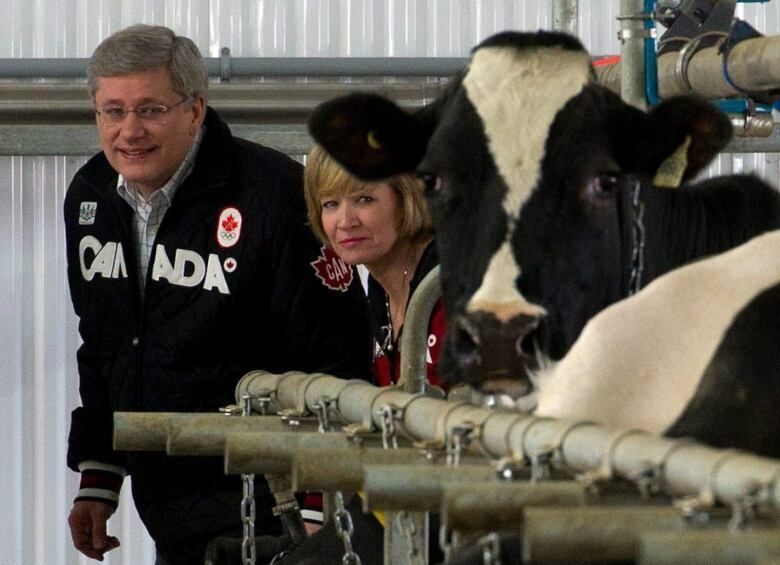 Dairy concessions were the price Canada had to pay to be part of all three of these trade deals. Wiens said farmers were asked to “take one for the team” for the sake of the country’s overall economic growth. The protected market they’re losing is unlikely to return. “We’ve taken a look at some of those things that are causing people to worry,” Morneau told reporters earlier in the day, framing the overall approach of his final budget before October’s election. These sectors definitely were worried. Farmers and processors urged the Liberals to commit to compensation comparable to what Stephen Harper’s government announced when Trans-Pacific Partnership negotiations concluded in the middle of the 2015 federal election campaign. The Conservatives said at the time that Harper’s cabinet had approved a compensation package in advance — one worth up to $4.3 billion if necessary, depending on the real losses the industry sustained over the deal’s first decade. But when the Liberals took power, they claimed this spending was never finalized. Nothing close to a compensation package of that magnitude has been offered since. One aspect of the Conservative plan — funding to help farmers and processors compete by upgrading their equipment and improving their efficiency — was replicated when the Liberals announced $350 million to offset the threat of competition from European cheese imports after the Comprehensive Economic and Trade Agreement (CETA) was signed in the fall of 2016. That funding was completely distributed almost immediately after it became available. When Canada’s concessions in the new NAFTA deal were finalized late last year, the Liberals launched a consultation process with the dairy industry to work out what additional help would be needed to keep the industry sustainable over the longer term. A $1.5 billion “quota value guarantee program” to protect the value of investments made by farmers if they are forced to sell their quota at reduced prices because new foreign competition has undermined the value of quota in what is now a less-protected market. It’s the same approach the Tories took to trade compensation: one pool of funds available for demonstrated income losses and to help rural communities with the transition, and a second pool to protect farmers and commercial lenders (who may have financed farm investments) from reduced quota values. Answering a reporter’s question during a press briefing ahead of the budget’s release, Morneau acknowledged in French that he was continuing the approach of the previous government. He said the exact details haven’t been worked out. Budget documents offer no timelines or criteria for these funds.The Finance Department also says work continues on addressing the needs of processors, who aren’t covered by this funding for producers. The government is also studying the “potential future impacts” of the new NAFTA. The revised North American trade deal not only gives up a share of the Canadian dairy market, it also implements export caps and requires the dismantling of Canada’s competitive price class for dairy ingredients — two concessions that may threaten the industry’s future more than new competition from imported products. Wiens said dairy farmers didn’t know this budget measure was coming, and they haven’t really seen enough details to comment fully. The timeline for this assistance may be key: “If this is paid out over many years it will have less of an impact than if it’s paid out aggressively,” he said. The concessions made in the new NAFTA are larger than those Canada made to get the former TPP, she noted. 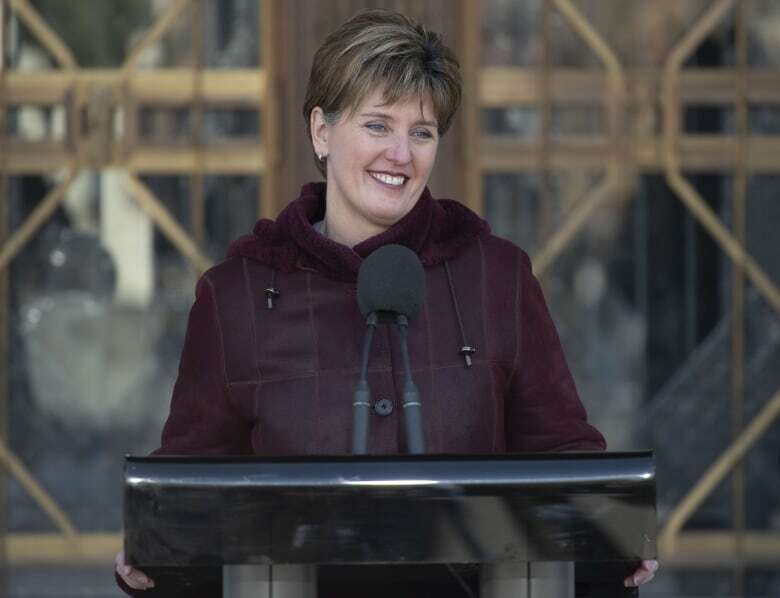 “It’s almost certainly a response to supply-managed farmers, who are well-organized, and well-funded, and they have no hesitation running advertising campaigns against the government or criticizing the government if they feel that they’re not being properly supported,” she said.